The moral values and interpretive systems of religions are crucially involved in how people imagine the challenges of sustainability and how societies mobilize to enhance ecosystem resilience and human well-being. 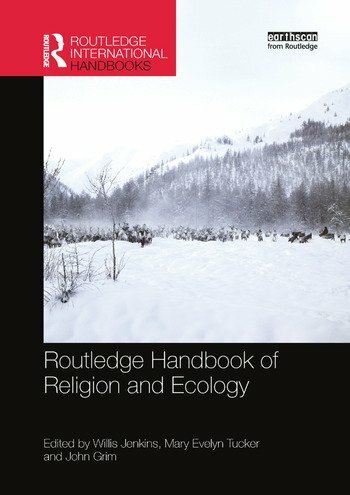 The Routledge Handbook of Religion and Ecology provides the most comprehensive and authoritative overview of the field. It encourages both appreciative and critical angles regarding religious traditions, communities, attitude, and practices. It presents contrasting ways of thinking about "religion" and about "ecology" and about ways of connecting the two terms. Written by a team of leading international experts, the Handbook discusses dynamics of change within religious traditions as well as their roles in responding to global challenges such as climate change, water, conservation, food and population. It explores the interpretations of indigenous traditions regarding modern environmental problems drawing on such concepts as lifeway and indigenous knowledge. This volume uniquely intersects the field of religion and ecology with new directions within the humanities and the sciences. This interdisciplinary volume is an essential reference for scholars and students across the social sciences and humanities and for all those looking to understand the significance of religion in environmental studies and policy. Willis J. Jenkins is Associate Professor of Religion, Ethics, and Environment, University of Virginia, USA. Mary Evelyn Tucker and John Grim are Directors and Founders of the Forum on Religion and Ecology 1998 to present, as well as Senior Lecturers and Research Scholars at the School of Forestry and Environmental Studies and at the Divinity School, Yale University, USA.